Twenty months ago, I explained why I’d become convinced that the “name” of Rheumatoid Arthritis must be changed. The more I’ve learned over the past few years, the more I could not deny that fact. Soon after that, I decided to write a little e-book examining the ways Rheumatoid Disease affects the body outside of the musculoskeletal system – maybe about 35 pages. But I wanted to get all the facts just right, so I researched and documented each topic. We can talk much more about the upcoming full-length book soon, but I’ll tell you right now what stunned me – how much I learned about things I already knew. Let me say it more clearly: I was more correct than I’d ever imagined. The historical term Rheumatoid Disease is still in use today and you don’t need to worry about being an oddball for using it. I can promise you this: the deeper you dig, the more obvious it will be to you that calling a serious disease “a type of arthritis” is the silly thing. 1) Rheumatoid Disease (RD) is not a type of arthritis (arthritis is one symptom of RD). 2) There is no benefit to people living with Rheumatoid Disease (PRD) to saying that it is (a type of arthritis). 3) The problems associated with poor care for RD are related to the underestimating of the disease as a type of arthritis. Some have criticized me for coining the terms Rheumatoid Disease and rheumatoid heart disease, but I can’t really take credit for them. I’ve just read lots of medical history in the past few years. The historical, and medically correct, term “Rheumatoid Disease” and its abbreviation “RD” are used today by clinicians and researchers, especially outside of rheumatology. If you were a pulmonologist studying the effect of RD on the lungs, you would feel silly talking about “arthritis” because you know there are no joints in the lungs. The same goes for eyes, heart, or vocal cords. (Below, 2 examples, emphases added). If you understand the reasoning behind using the term RD, go ahead and use it. You’re not alone, and you’re not wrong; you’re a trendsetter. There is more to come soon with the book, and some other opportunities to make a difference. If you’re unsure now, the book will likely convince you, and make you an advocate for RD. But if you agree, don’t wait to say RD out loud to your family, your doctors, your patients, or on social media. 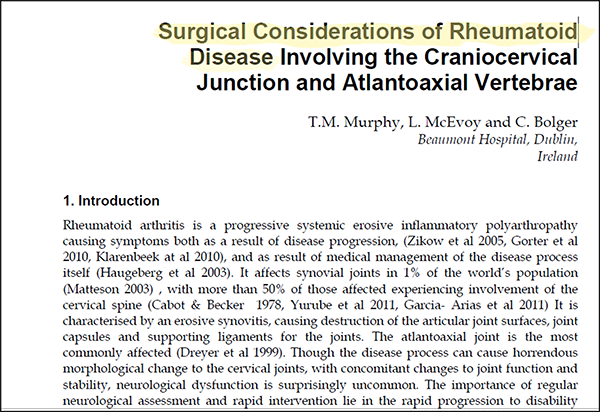 To some degree, RAW must continue to use “Rheumatoid Arthritis (RA)” for a period of time alongside of RD in order to educate the new readers who find this site every day. By using both terms together, RAW is also educating the search engines (Google, etc.) that the new term, RD, can be used to mean what it knows as RA. I also agree 100% that the name of this disease MUST be changed it we are ever have it recognized as the beast it really is. About one year ago I started referring to it as rheumatoid autoimmine disease, and just added a “D” to the end of RA. I now call it RAD. Hi Lori. RAD was actually started by me & that was part of the reason. Pretty quickly after that, I backed away from using the word “autoimmune” because of the advice of a researcher. It is likely that there are different causes of RD, and they may not all be autoimmune. Also the concept of autoimmune is still not well understood, so someday we may have a more specific understanding of the reason for the immune activity, and we may not use that word. That’s discussed some in the book. Therefore for science reasons, looking forward, I chose the very simple “disease” instead. It really caught on that first time I advocated RAD (https://www.rawarrior.com/we-refuse-to-be-mislabeled-updating-rheumatoid-arthritis-ra-to-rheumatoid-autoimmune-disease-rad/) but no one can see the future and we do our best. Ahhhh… I knew it was a smart choice! Lol For me, I almost hate even having the word arthritis in it, since that is only one of many symptoms. In my case, not one of the worst by far. I feel so misunderstood with that word. Don’t get me wrong, it’s not that I have no joint pain, because I definitely do, but the pain from that is nothing compared to other pains and symptoms that I have. I will be glad to see any change though. Kelly, you are truly amazing. Thank you do much for all that you do. You are brilliant. I like being called brilliant. 😉 But all I really did was LISTEN to patients – something many others could’ve done, but didn’t. And then just read – the facts are out there – it just takes a little digging. I guess my drive to prove the truth is the one good thing that has come from living w/this terrible disease. No, I’m sorry, but I have to disagree, you are indeed brilliant. 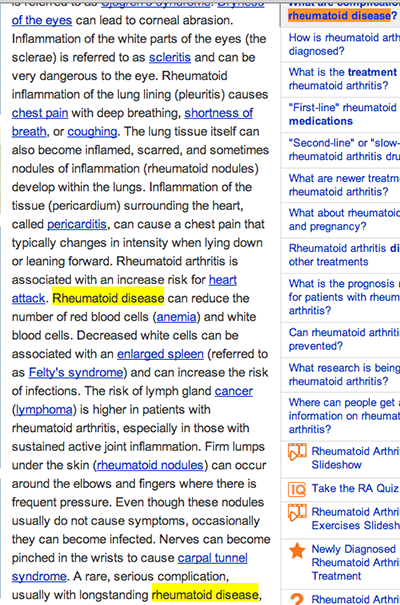 Since then, he has only referred to it as “Rheumatoid”….he doesn’t even say “RA”! Yes, mine did too. They called it “the rheumatoid.” Then never used the “a” word (arthritis) to me. the name change sounds like the ez part..trying to get insurance companies to accept that things unrelated to a joint are still part of RA. ex. fibromyalgia symptomatic/not diagnosed. ..sjodgrens symptomatic/not diagnosed. my present problem..my teeth are literally cracking off..between being on Osteo drugs for decades ,each oral surgeon has asked me..which was the reason I was even made aware of the fact.Osteoporosis drugs affect your teeth.not to mention being sjodgrens symptomatic,dry mouth causes tooth decay at alarming rates. I do think it will go hand in hand. I’ve worked on this a long time now. Changing what the person sees on the screen, when they pull up your diagnosis, will make a big difference. Medical coverage will follow medical opinion and it will just take time to educate the medical profession about all of the ways RD affects people. My book is a good step for that. I agree it will take time, but name issue is the first step. ..broken teeth rotting..empty spaces..and medical insurance companies don’t feel that not being able to chew food is a medical issue.. I have appealed their denial up to the judicial level..who just recently somewhat ruled in my favor. when I figure out what it is I’ve won..I will update! I’m in my second “flare” that involves my lungs, voice and hearing. My Rheumatologist won’t even say Rheumatoid. He only says arthritis, and he told me flat out that it’s not affecting my lungs, throat and ears.. i’m just fat, even though i’m no heavier than i was before being sick, and prednisone is helping.. albiet very slowly. I think the mindset needs to start at the rheumatologists first, so they have the respect for this disease as more than sore knees. My primary care doctor does way more for me than my rheumy, and we are shopping for a new rheumatologist together. 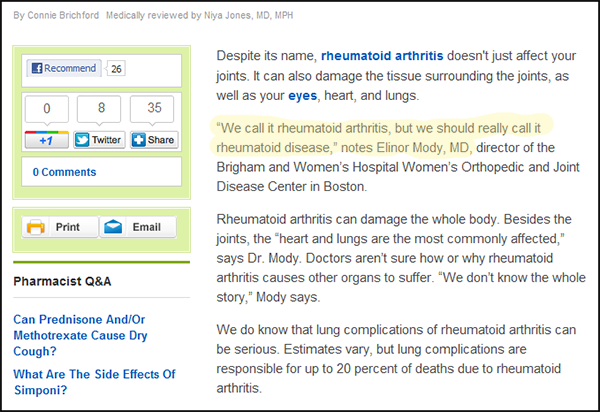 You’re correct that many rheum docs are ignorant of what the disease can do – due to being trained that it is a type of arthritis & that any “complications” are rare. As I’ve written for years, systemic disease is not a “complication” of the disease – so as you describe the mindset needs to be changed. So, if it goes against what his training is – he just dismisses it & saying “fat” is just a convenient excuse. Do what you need to take good care of yourself. Kelly, I am sorry if this is not the proper place to ask this, but I am curious… To your knowledge, have there ever been any thorough studies done on people with positive anti-ccp, as opposed to those who test negative. If so, where would one find such information? Yes, ACPA / ccp is something they keep track of in many studies. It does seem to correlate with more aggressive disease. Biomarkers – ccp and others are a big topic in research right now – trying to find ones that will predict treatment response or disease outcome. Here are some references on the fact that having positive anti-ccp is associated with a worse disease course. The association of positive anti-ccp being associated with a worse disease course is well established in the research on RD. Thank you very much for the links Sally. I am going to read them later. I know that anti-ccp means more aggressive disease, but I was wondering if they know more about it. Right after my diagnosis, within 2 months of ra completely taking over my body, I started experiencing life altering migraines, to the point where I literally have no life because of them. They are severe and I have them literally about 75% of my life now. I never had one before in my life, or even headaches for that matter. I started experiencing extreme lower back pain at this time as well, to the point that I can’t even stand or walk, or even roll over in bed for that matter. The pain is absolutely excruciating, even when laying still. I am hoping to find if perhaps others who are anti-ccp positive have had similar experiences. I am so glad to hear that there is lots of research being done regarding anti-ccp. Thanks again for the links. I too have begun to have bad headaches and also the excruciating pain in my lower back. Like you even turning over in bed is more than I can do at times. My rheumy tells me none of my pains or problems are associated with RD. (to her it is just arthritis), only affecting my feet and hands. I am so thankful for Kelly and all her research and support. She is a lifesaver! Pray you can find some relief soon. Hi Nancy. Thanks so much for the reply. I’m sorry to hear you’re going through the same things as me. It’s crazy. How long after your ra did the other things start for you? Also, are you anti-ccp positive? When I first started seeing my rheumy she was so open minded, then not too long after, she completely changed that. I swear I think she has a split personality or something, and I’m not even kidding. I’ll have a super long conversation with her, say about a medication change or something, and I’ll start the new meds, and then if I email her with a question a few days later she has no idea what I’m talking about. It’s absolutely bizzarre, and more than frustrating that our well being is in these people’s hands. Kelly, thank you is insufficient to express the gratitude thousands of us have for your dedication, BRILLIANCE, and perseverance in changing the face of rheumatology for the millions who continue to suffer with this misunderstood disease. May God bless you and sustain you in your work. WOW! This makes perfect sense and is the missing piece of information that I needed to connect my symptoms as a child to those an adult. Thanks so much for you hard work of digging this info up! We are making progress. While at PT last week, the therapists first question was “how long have you had rheumatoid disease?” That was after reading my history. Every step we take gets us closer to where we need to be. yes I got an email from a patient who took a photo with her phone of the form she filled out – that said rheumatoid disease instead of RA on it. I too am trying to educate those around me about RD. One of the most difficult areas is to enlighten those around me that this is not just arthritis. When I told my brother I had RD he said, “Oh, I guess your knees hurt then”. It amazes me how many Minds I see shutting down once you try to explain that this is a disease that affects many organs along with joints. I will continue to try to open the minds of those around me. It is a small start, but an important beginning. It is one of my theories that rubella vaccines may be the culprit for many joint conditions. It is a documented fact that the vaccines (MMR) are linked to sudden onset of joint pain, especially in girls and women. I started having joint pain in college (when they required measles vaccine to attend). Some women (like myself) have had the vaccine multiple times because for some reason the antibodies don’t show up in tests and it looks like there is no immunity, so docs compel ladies to keep getting the vaccine. They always test for rubella antibodies during pregnancy. I have had the vaccine at least 4 times. I suspect the numbers of individuals affected goes under-reported and is even higher than they think because people don’t make the connection. I never have reported joint pain as a side effect after getting mine. Hello Kelly I have been using the word Rheumatoid Disease with friends and family. Trying to get them used to it. If they ask about it then good I will tell them the real story. There’s nothing I can say to my Rhuemy that she will argue it with me. She is just the type who wants to be in charge down to words. It’s ok tho I keep trying and she does take care of me. I will push on to get the right name out there. Recently I was having check ups with all my docs (cause I hate going out in winter) so I would say RD and they would correct me with RA. Great! Gave me an opening to have that conversation. So I will fight on. After all I’m a RDWarrior! Veterinarians don’t use “autoimmune” instead they use “immune-mediated.” Personally I like this phrase. Immune-mediated rheumatoid disease suggests some type of immune system involvement, but not the dominance of autoimmune. Language and naming things is so important. Thanks for your work with this, Kelly. Is there a way I can get a copy of your e-book about RD? I’d love to read it, and am really looking forward to your “big book” LOL God bless! I have been using the term Rheumatoid Disease for my condition for a while now. When people hear Rheumatoid Arthritis they automatically just hear the word “arthritis” and have no clue that this is an autoimmune disease and not “just arthritis” as they assume. I was really touched by your story. Thank you for posting. I’ve heard rheumatologists say that someone has pain because they have joint damage but no active disease. Often, they have no basis for making this statement if all they’ve done is push around on your joints and they can’t see active inflammation or if your CRP and ESR are normal (which happens in at least 40% to 60% of people with RA). I know Dr. Margaret Larche is a rheumatologist in Ontario who trained at Leeds in the UK. The UK is light years ahead of Canada in rheumatology care, in my opinion. Dr. Larche is head of the rheumatologists’ musculoskeletal ultrasound initiative in Canada. She would be a good person for you to see if you’re interested in having an MRI or ultrasound of your joints to see if there is active inflammation, bone erosions, and hyperemia – all hallmarks of active disease that can be proven objectively. Dr. Keystone is also a world-renowned rheumatologist in Toronto, I believe. I’m not sure he uses advanced imaging as readily as some others. At 44 years of age (well at any age) you deserve the best rheumatology care there is. Thanks again for your amazing story of enduring a life long co-existence with this misunderstood disease. “Rheumatoid DISEASE!!!!!!!!!!! !” Yay! Yes, all the other symptoms are related to RD, despite their existence somewhere other than my joints. I really am not going nuts after all. And just because a Panadol Osteo works for someone’s great aunt Betty but not me, it doesn’t mean I am a malingerer, I have a systemic disease of which arthritis is only one symptom. God bless you Kelly! Thanks again Kelly for making more sense out of all this! After getting so tired of hearing “You are too young for that,” or “Yeah, my grandmother had that,”, (seriously, I am 48, do I look like your grandmother?!? ), I have begun to tell people “I have rheumatoid disease, which you may know as rheumatoid arthritis, but it’s really much more than just painful joints.” Now if we could only get the drug companies to advertise it correctly on all those TV commercials, so the rest of the world can follow along with us! Perhaps a very respectful letter writing campaign to the drug companies showing our appreciation for the miracle of Biologics and suggesting some ideas for their consideration would be a worthwhile project. I think a coordinated effort would be advisable and likely the most effective. I’m all for the name change. I do believe AUTOIMMUNE should be used . I have seen “RAD” used (Rheumatoid Autoimmune Disease). But ARTHRITIS should not be used to define this disease. Living with RD is had enough with always having to explain it not just Arthritis. I agree grrrr not sure where to vent but I just had a big fight with my r.a doc when I told him what I have learned reading on r.a warrior.com. and about R.D.! He disagrees with everthing I told him. He needs to come here to learn about. R.D I hate finding out how ignorant he is about this desease he must have a lot of student loans to pay back on the text book stuff he learned in school. Changing the name to Rheumatoid Disease is such an important part of winning the battle for validation of our experiences and the future of treatment. I vow to use that name from here on out and correct myself if I forget. I don’t want to contribute to our dis-empowerment by using the term RA. I will be seeing a new rheumy in the near future and I’m hopeful this will be a vast improvement over my last one. He always asked me how my arthritis was and focused soley on my hands. I felt so bad every time I left his office. Having just relocated to a new area, I also got a new primary care doctor. Imagine my surprise when she told me she’s had RD for 18 years! My discussion with her was one of the most validating things that has happened to me since my diagnosis. We talked about my dream to work again with this disease (she only works 12 hours max per week in the office, ) and she acknowledged all my symptoms. She spent a large amount of time with me and helped with lots of tips. I could have hugged her to pieces!! A nurse friend, on the other hand, continues to bring up osteoarthritis no matter how hard I try to educate her. She says she’s never heard of Rheumatoid Disease, and didn’t even know chemo drugs are standard treatment. All I can do is continue to correct her, educate her, and not let up on it! Rheumatic Disease is a much better term for this vicious life spoiler. I have only told a few people of my diagnosis with sero-positive RA because I can’t stand the reactions and don’t know how to respond effectively without being offensive. However, I don’t want to trivialize the arthritis aspect of the disease. My joints, especially those in my hands and feet, hurt so much sometimes that all I can do is sit and cry. (I think the crying helps relieve the muscle tension a little.) I will encourage the use of RD whenever the opportunity arises. Also, thank you for the information about ACPA. My score on the test for this was three times the value for “strong positive.” I don’t really know what it means and look forward to plowing through some of the referenced articles. Thank you, Kelly. This website feels like a life line to me. Thank you, fellow Warriors.